Note from GuitarAttack: A good, out of the box kind of bass. Love the pickups and the dogs. Great work! 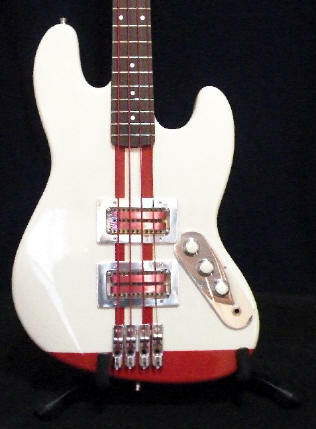 The kit is the Saga JB-10 jazz bass replica. The body and neck are the only original Saga parts. I built a Carvin kit last year but regret building a five string bass because I still have trouble playing it. As a result, I built the Saga. I figured that I had some extra cash and the opportunity to build what I want so I replaced everything but the wooden bits. The pickups are Q-Tuners www.q-tuner.com. They have a very crisp and clean sound just as the manufacturer claims. I highly recommend them. The individual bridges and the tuning keys are from Hipshot. The polished aluminum control cover and pickup rings are custom made from fretsonthenet, www.fretsonthenet.com. Ask for Dave. His prices are very good and the quality is top-notch. Controls are standard fare 500k from StewMac. Strings are DR Red Devils. I finally finished everything except aligning the individual Hipshot bridges and screwing them in place. For now, the threaded bushing for the string-through mount is holding them secure. I also still need to adjust intonation so the location of the string-grooves are just randomly placed. The decorative covers over the pickups are slightly crooked because I mixed their proper locations. When I secure the bridges I will swap the locations and they will line up properly. Thanks to everyone for their inputs! It sounds great. When I get a chance, I will try to upload some sound files. 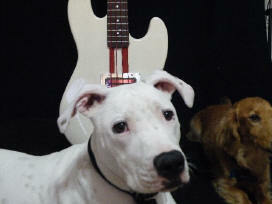 I included a shot of my assistants, Riggs and Hobson. They will never be the same after breathing the paint fumes! Great work, Jeff! Take care of the dogs!